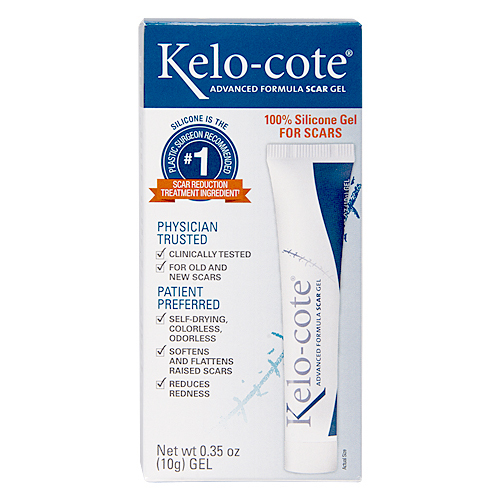 Kelo-cote® is intended for the management of old and new scars, including hypertrophic and keloid scars, resulting from surgery, trauma, wounds and burns. For prevention of abnormal scars, use as soon as the wound is closed or sutures are removed. Kelo-cote® is suitable for use on children or people with sensitive skin. This 10 g tube is enough for 90 days effective treatment of a scars size 3-4 inches (7.5cm - 10cm). Ingredients: Polysiloxanes, Silicon Dioxide Directions: Ensure that the affected area is clean and dry. Apply Kelo-cote® twice daily as a very thin coat and allow to dry. Once dry, Kelo-cote® can be covered with cosmetics or sunscreen. Recommended duration of treatment is 60-90 days. Clinically tested for OLD and NEW scars.